How Do I Declutter Paper? Whether you hire an accountant or leave it till the last minute, doing your taxes involves getting lots of paperwork together. During this time, the rest of your home may fall into temporary disarray while you stay organized with tax related items. Paper has a sneaky way of taking up space. A small receipt left here and there doesn’t seem like much at first. But before you know it, there’s magazines on the counter, bills stashed in a junk drawer, and random sheets on your work desk. Oh, and your shelves have run out of space to store the newest book you just ordered online. We’ve put together simple and effective tips on how to organize the different types of paper in your home. Listen to Justin address this topic on Episode 465 of Optimal Living Daily. 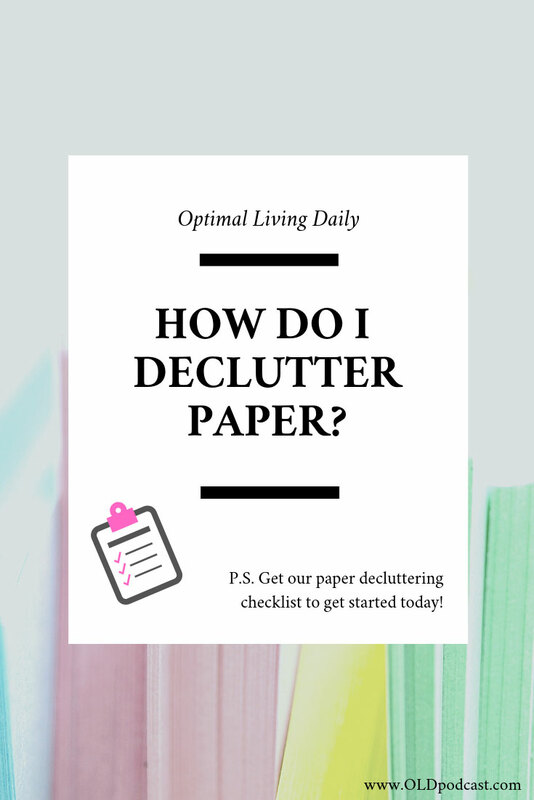 Grab our checklist on how to declutter your piles of paper. 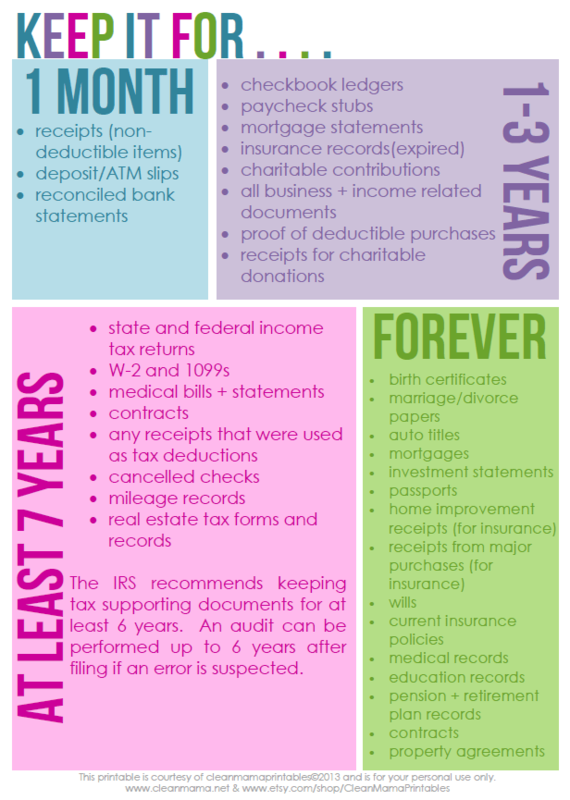 Clean Mama has a printable page on how long you should keep your important documents. Items like receipts and bank statements should be cleared out relatively quickly, while items such as insurance policies and tax returns need to be kept for longer. Having a clear idea of which documents should be stored will save you time and stress during the decluttering process. Shredding and recycling documents will also help keep the clutter at bay. Going paperless has several benefits when it comes to bills and statements. If you’re concerned about having access to previous statements, check with your issuer on how long they store your statements online. You could also take a screenshot of your paperless statement each month and file it digitally. There is also the environmental impact of going paperless. According to BluePay, if 20 percent of American households signed up for paperless billing on items like utilities, it would prevent nearly 700 million pounds of greenhouse gases from being produced. Keeping in mind the effects of paper wastage on the planet and environment is a surefire way to stay conscious with your paper consumption. Your efforts with decluttering paper will go further if you have folders or boxes for different types of documents. When these specific items have a ‘home,’ you know exactly where they should be and where to find them. Toni from A Bowl Full of Lemons labels each file folder according to what was stacking up on the counter. Paper piles no more! You don’t need a lot of space or to spend a lot of money on your files and folders. Staples, Target, and Walmart have file boxes from $8 and up. Rachel, the Messy Minimalist, scans her receipts with the paid version of the iScanner app. These are some honorable mentions when it comes to other common types of paper clutter. Go through your subscriptions and decide which magazines you truly need and read. Think about swapping over to a digital subscription or cancelling the subscription if you can do without it. Is flipping through the magazine each month worth the frustration of piles of issues that you’re not sure you’ll ever read? When it comes to decluttering kids’ artwork, it helps if you know the right questions to ask yourself when deciding what to keep or discard. Is this piece of art a duplicate? How much effort and time did your child put into this artwork? Which item does your child want to save? If you’re going digital, you could take pictures of the artwork and put them together in a neat photobook through a site like Mixbook. 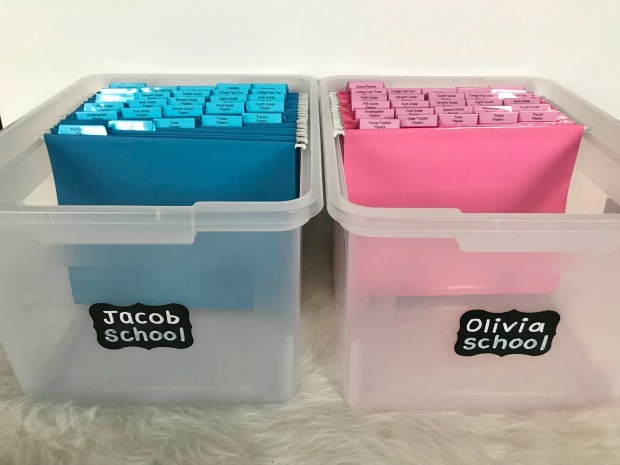 School papers neatly stored…in a single box? Lindsay created a box for each of her kids’ school papers. The items she got included a hanging file box, labels for the boxes, manila folders, and a set of hanging file folders. Aside from school papers from each grade, the other categories Lindsay included were Grades, Awards, Keepsakes, and Photos. Her tip is to BE RUTHLESS when it comes to saving your child’s papers from each grade. It’s much better to have one box of treasured mementos compared to ten to twenty (or more) boxes that neither you nor your children have time to look at. Lindsay plans to hand over the boxes to her kids when they graduate from college, so they can see what they accomplished during their school career. It’s a time capsule they couldn’t get from anywhere else. Decluttering books is such a big topic that it deserves its own post in a follow-up article! Remember to be consistent to prevent paperwork from overtaking your home space. 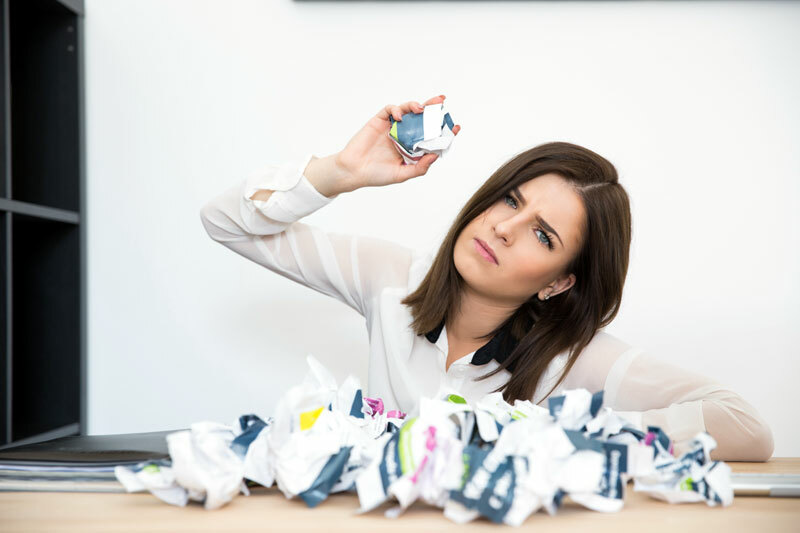 Because paper can accumulate so quickly, it helps if you can set aside some time each week to handle mail and other documents as they come in. Make sure they’re in the specific areas they’re supposed to be in your home to keep things tidy and manageable. Once you’re on your way with decluttering paper, you can take the next step by educating your friends and family on why it’s important to you. Another way you can maximize your long-term efforts is to choose to support companies that are committed to sustainable practices. This is because forest-friendly policies are vital when it comes to the production of commodities like paper. Greenpeace.org has some great tips on how to take action. 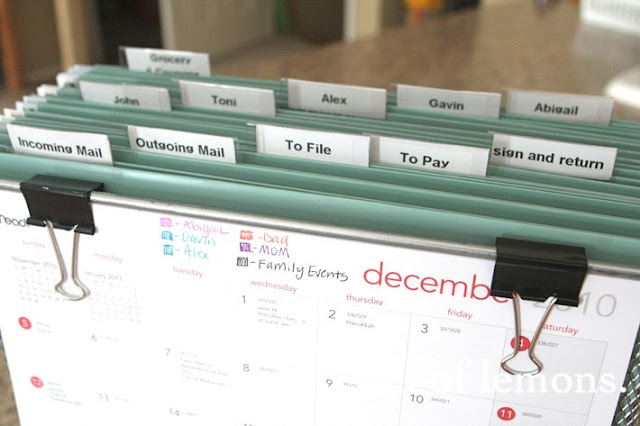 We hope this this post helps you manage and organize the paper in your house. Do you have other tips you’d like to share with our readers? Let us know on our FB Group or Instagram!